If asked, most of us want to make a difference, to live and love generously. But we get caught in the crazy rush of household routines, work demands, cranky attitudes, difficult people, exhaustion, worry, and pride, and once again we fail to love the people around us at all--let alone well. We too easily default to focusing more on self than on others, on receiving more than giving, in ways we don't even recognize. We dream of reaching out. We just . . . forget. Or don't have the energy. Using relatable stories, discussion questions, and careful application of God's Word, author and speaker Becky Kopitzke gives you the inspiration and practical tips and ideas you need to see the opportunities around you, to reach out, to live generously, and to love others bravely and selflessly. To bless and be blessed is to actualize the joy of Christ--and to propel love forward. Cassandra's Review- I love the saying that is cost nothing to be kind, and I also love the debate of that saying. The book kicks you in the pants and gets the reader to open their eyes to the world that is currently being torn. 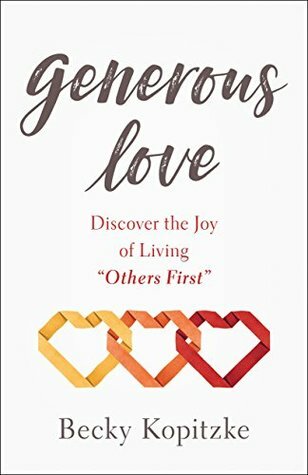 If you believe in what the author is saying and take her wisdom as your guide, this book will help and possibly change your outlook on giving even when it seems hard or not worth it.